Jimmy “The Greek” Marcus, Smith Grind, Skatepark of Tampa. Our buddy Gio Fournier put together a killer little edit of some of the shredding that took place a couple of weekends back at the 2015 Florida Bowl Riders Cup at the legendary Kona Skatepark in Jacksonville, FL. Check the full results here. 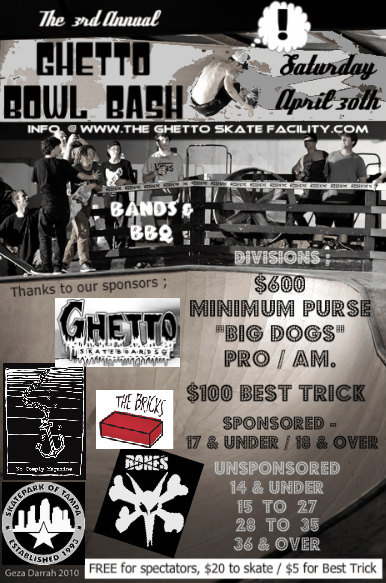 Had a blast last Saturday at SPoT for the 2013 Florida Skateboard Hall of Fame Inductions & Bowl Jam. Congratulations to all of the 2013 inductees: William Beauregard, Donny Myhre, Keith Holien, Jimmy “The Greek” Marcus, Chuck Hults, Brian Schaefer, Mike Frazier, Jim Goodrich, Darrell Jones and Elissa Steamer. Check out more photos of the induction ceremony here. Rich Payne and Mike Frazier. Manny Amorelli Sr., Frontside Ollie over the hip. 2013 Florida Skateboard Hall of Fame inductees. Kyle Randall, Signature Boardslide through the corner. Yoda and Jimmy “TheGreek” Marcus. Ricky Burns, Rich Payne, Jimmy “The Greek” Marcus, Yoda, and Tyler Coffman. Paul Schmitt, Fakie Ollie over hip to Frontside Lipslide. The snack bar was packed for the induction ceremony. Got a grip of new Instagram submissions. 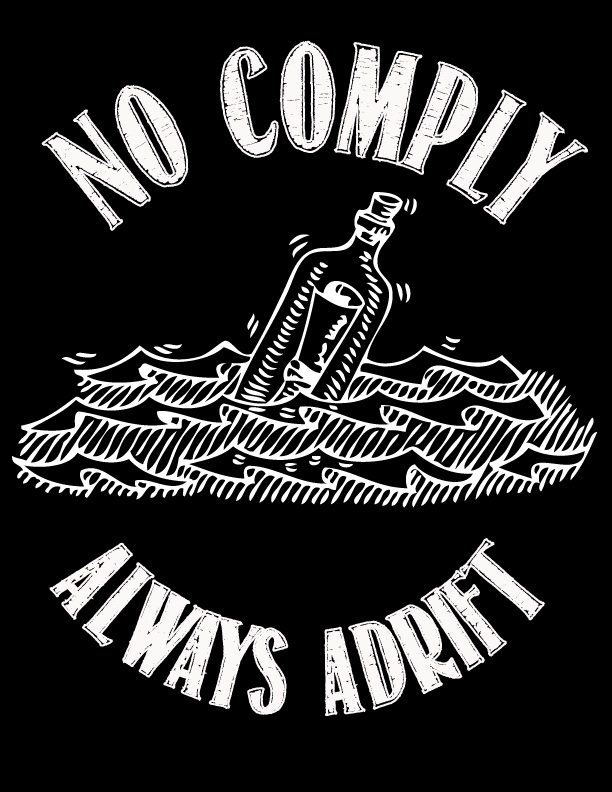 Tag your Instagram photos #nocomplymag. @feedthetao, hardflip at Lake Vista. @derek_antiair, Smith Grind, New Smyrna Beach Skatepark. 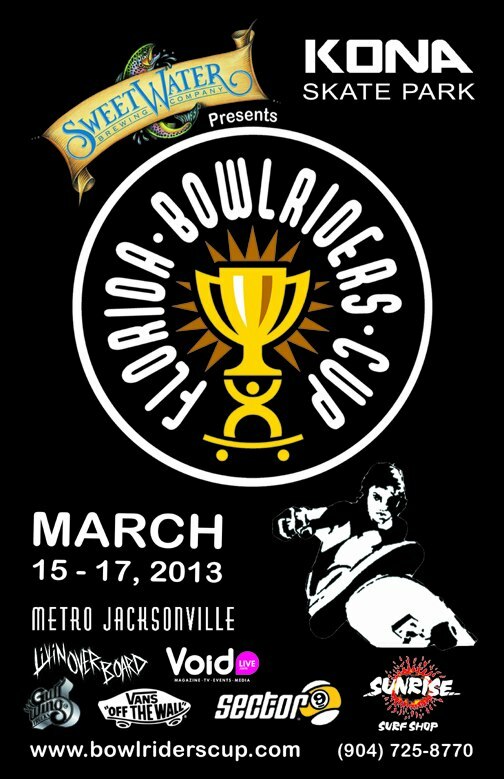 7th Annual Florida Bowlriders Cup Finals Edit & Photo Gallery. Check out the killer edit of Sunday’s Finals Presented by Autoline Preowned. Then, make sure to click on over to the next page to scroll through the massive gallery of photos. Check the Photo Gallery here. When the Bones Wheels team rolled through Florida a few months back, they did a demo at P(a)yne Skatepark in Sarasota and tore the place up. Check out this weeks Mo’ Mondays featuring: Jimmy “The Greek” Marcus, Ben Hatchell, Kevin Kowalski, Steven Reeves, and Brad McClain makin’ it look easy! While you are at it register to WIN wheels, bearings, bushings, t-shirts, and more! Most of the Bones Wheels “Pool” Team, consisting of Jimmy “The Greek” Marcus, Kevin Kowlaski, Brad McLain, Steven Reeves, and Ben Hatchell rolled through Florida last month on a backyard pool skating/ filming mission. The whole trip was organized by Miami local Seth Levy. Seth apparently is relocating out of the Miami area and had a list of a bunch of backyard pools that he wanted to skate before leaving. Earlier this year at the Florida Bowlriders Cup, Seth was talking with Rob Washburn, the brand manager at Bones Wheels about his “list” and Rob thought it would be cool if the Bones Wheels “Pool Division” made a trip out of it. Just a short couple of months later, that trip became a reality. Check out this video with an interview with Seth Levy, backyard pool skating footage, Circus Bowl footage, and even some cool time-lapse footage of a complete emptying/cleaning of a Florida backyard pool! Look for more footage in the upcoming Bones video! Filmed and Edited by Drew Perlmutter. The latest installment of Bones Wheels’ Mo’ Mondays finds Jimmy “The Greek” Marcus, Ben Hatchell, Steven Reeves, Brad McClain, and Kevin Kowalski absolutely shredding the Circus Bowl in south Florida when they were here a couple of weeks ago touring around the state. 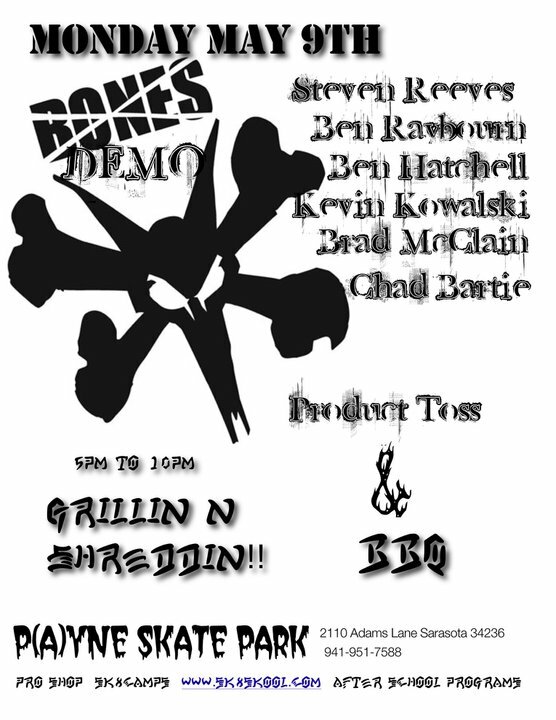 Bones Demo at P(a)yne Skate Park is Tonight! Tonight! 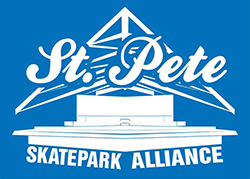 P(a)yne Skate Park in Sarasota…Be There! Shredding, BBQ, Product Toss, BYOB (Cans Only)! Gonna be rowdy!